Bookburners: “Alexander Norse” by Margaret Dunlap. Season four: episode 3. In the newest episode of Bookburners, the murder investigation continues. Welcome back to my weekly Bookburners reviews! 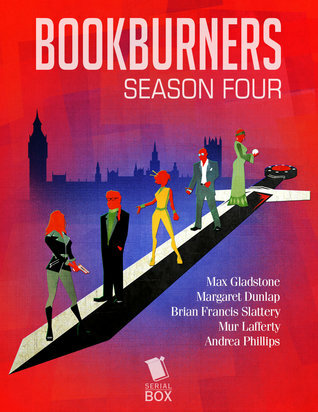 If you’re not familiar with Bookburners, it’s an urban fantasy serial story written by an amazing team of authors. Also, since I’m not several seasons in, this is not the place to start. Spoilers for up to this episode will follow. “Alexander Norse” starts with another murder, this time one of the wolf-sisters who we’ve gotten brief glimpses at in earlier episodes. They’re a magical group that bonds with wolves somehow? And they’ve got magical tattoos that might not be actual tattoos? Anyway, Alexander Norse kills someone else. This has officially gone from being a single murder to the spree of a serial killer. Thankfully, the team’s got Sal. I don’t usually think about Sal’s past or where she was at in the very first Bookburners episode — an NYPD detective. Sure, it’s come in handy a few times before, but in “Alexander Norse,” Sal’s doing what she’s done professionally for years: tracking down a killer. Of course, not everyone on the team is happy with Sal’s progress. Ashanti wants Norse’s head on a platter immediately, and she’s frustrated that things aren’t going her way. Also… what do they do with Norse when the catch him? Can they capture him alive? They don’t have the resources of the Vatican behind them anymore, so what would they even do with him? It’s a complicated ethical question that doesn’t receive a whole lot of space given the focus on the new murder and investigation. Compared to last week, this week’s episode was a lot more plot-focused. There was less character development, although we still got to see a new corner of the world through the Wolf Sisters. Once you stop thinking of the immediate problem (Norse around and killing people), larger ones re-emerge. Isn’t this just a distraction from the whole “world is ending” thing? And how did Norse get back to our reality anyway? Is he acting under his own volition or is someone/something controlling him?